Eustace Edward CLEMENTS was the son of Charles Edwin, [b.c. 19 April 1866 in Wing, Buckinghamshire] and Mary Ellen, née Lee, Clements [b.c. 1865 in Stony Stratford, Buckinghamshire], who were married on 28 December 1891 at Saint Andrew’s church, Rugby. Mary Ellen and her parents – Frederick, who was born in Hillmorton, and Jane Lee – had lived in Rugby at least from 1864 when Mary’s sister, Minnie, was born there and in 1871 and 1881, when they were living at 768 Old Station, Rugby. In 1881, Mary Ellen was 21. Mary Ellen returned to Rugby to have her first child, Eustace, whose birth was registered, as Eustace Edwin Clements, in Q1, 1893 in Rugby [Rugby, 6d, 577]. Eustace was baptised in Rugby at St Andrew’s church on 12 March 1893. His military Service Record though, would later give his birth place as Northampton – his early home – and his second name as Edward – and indeed on one record his religion as Roman Catholic! In 1901, the family were still living in Roade St. Mary, Buckinghamshire, with their children: Eustace E Clements, 8; Dorothy Clements, 6; Freddy Clements, 3; and Oscar Clements, 2. 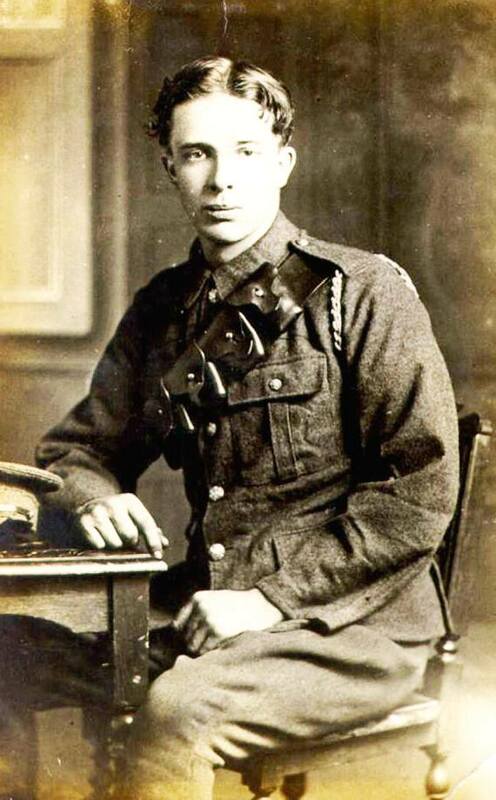 In 1919 Sidney and Edwin Clements would be given as the names of his surviving brothers. There are two sets of surviving Service Records for Eustace – or Eustace Edward or Edward as he was known to the military. One set of records of five pages, and one set of 23 pages, with some duplications. There is also a Medal Card and his CWGC entry. Unfortunately the Service Records are of very poor legibility in many cases, and parts are missing as they were probably recovered from the ‘burnt records’. Eustace volunteered early for war service and was attested in Rugby on 31 August 1914. When he enlisted he was 21 years and 232 days old. He was 5 foot 11½ inches tall; weighed 160 lbs; had grey eyes and light brown hair, and his religion was Church of England. He was certified ‘Fit for service in the Royal Garrison Artillery, RFA’. He became a Gunner, No.1679, in the Royal Field Artillery. His previous trade was listed as ‘fitter’. From 31 August 1914 to 12 September 1917 one set of records suggest he was on a ‘Home’ posting – which would seem to be in conflict with other records, and omits one of his postings in France! He was initially in 51st (R) Battery, R. F. A. and had various postings before the end of December 1914 and would later be promoted to Corporal. On 1 September 1914 he was at Hilsea, then on 9 September 1914 he was posted to ?13 Reserve Brigade, and on 15 December he was at Frome and on 17 December 1914 with ?/111 Battery. His military career was not faultless. On 29 March 1915 he was ‘absent without leave from 10pm 29/3/15 until 2pm 30/3/15, 16 hours’ and was admonished and forfeited one day’s pay. Then at Winchester on 20 May 1915 he was ‘Absent from town piquet’ and was confined to barracks for two days. On 10 September 1915 at Lille Barracks, he was ‘Absent from base [or ‘leave’?] 12 noon to 4.30 pm, 4½ hrs.’ for which he received 7 days field punishment No 2. On 28 May 1915 it seems he was posted to the B/113th Brigade, and was vaccinated in July 1915. Although an alternative record stated that he went to France on 25 September 1915 after ‘home service’ of 1 year and 25 days, however, there is again confusion as Eustace’s Medal Card stated that he went to France on 20 September 1915. He would, in either case, have been entitled to the 1914-1915 Star. He served in France until 10 June 1917 [one record stated 1916!] as on 7 June 1917 he was wounded and was evacuated first to 20th General Hospital, Dannes Camiers, and then ‘Home’ by ship on 11 June 1917 and admitted to the Horton War Hospital with ‘Gun S W right forefinger crushed, contusions of leg’. He was discharged on 17 July 1917, however another report notes ‘Finger healed but distal joint stiff. Has [morn]ing massage. Sent to Command Depot’. Indeed, he was posted to the Command Depot at Rippon on 28 July 1917 and then posted to 56th Reserve Brigade on 31 August 1917 until 12 September 1917. He was then posted back to France on 13 September 1917 and seems to have been moved to A/307 Brigade from Base on 26 September 1917, and then to A/306 Brigade F. A. on 8 November 1917. On 12 December 1917 he was wounded again, presumably comparatively slightly as he was discharged on 17 December 1917. On 9 May 1918 he was wounded yet again and apparently suffered a ‘… Shell wound severe …’ and was evacuated back to England on 10 May 1918. On arrival ‘Home’ on 11 May 1918, he was initially admitted to Southwark Military Hospital, London S.E. being treated for ‘… ? gas shell poisoning?’ until 16 July 1918, when he was sent to the Convalescence Hospital, Eastbourne, until 10 August 1918. On 19 August 1918 he was posted to 60th Reserve Battery, R.F.A. and granted ‘Leave with free warrant’. Presumably he was now no longer fit for front line service as on 17 October 1918 he had a ‘compulsory transfer into the Labour Corps as Private, No.669461 at Sutton’. This suggests that he had been medically rated below the ‘A1’ condition needed for front line service. Being less than fully fit for service, it was perhaps not surprising that he was taken ill again, struck down by the flu epidemic was sweeping the world. He died, aged 25, in the Horton War Hospital, Epsom, on 12 November 1918, from ‘Acute Bronchio-Pneumonia & Influenza’. The second page of a telegram on 13 November 1918 confirms ‘F C Labour Corps 1 acute Lobar pneumonia 2 influenza Warspital Epsom’. Only the name ‘Clements’ can be read on the first page. After a funeral in Rugby, he was buried in Rugby’s Clifton cemetery in plot, J192, with a CWGC headstone as Gunner Eustace Edwin Clements, Royal Field Artillery, Service Number, 1679. The CWGC has him as aged 24. Three items were published in the Rugby Advertiser on 23 November, a report on his death and funeral; the family’s announcement of his death; and their ‘Acknowledgement’ and thanks to friends. MR & MRS CLEMENTS & FAMILY wish to thank all kind Friends and Neighbours for sympathy shown to them in their bereavement; also for all floral tributes sent. The family were then living at 33 Winfield Street, Rugby. It seems that his mother received a separation allowance of 5 shillings per week. Eustace was awarded the Victory and British medals and the 1914-1915 Star which were sent to his father in 1922. This article on Eustace Edwin Clements was researched and written for a Rugby Family History Group [RFHG] project, by John P H Frearson and is © John P H Frearson and the Rugby Family History Group, November 2017. Hilsea Lines includes 18th- and 19th-century fortifications built to protect the northern approach to Portsea. The Lille Barracks were one of the six barracks in the Aldershot Marlborough Lines which were built in about 1890; the Lille barracks were demolished in 1958. St Saviour’s Infirmary in East Dulwich Grove … was built in 1887 by the Guardians of the Poor of the parish of St Saviour’s, Southwark. The Royal Army Medical Corps took over control of the infirmary in East Dulwich Grove on 11 November 1915, which at the insistence of the guardians was named Southwark Military Hospital. The hospital was fully equipped for 800 patients … the existing Medical Superintendent Dr A Bruce was appointed the rank of Major and served as its Officer in charge for most of the three and half years the hospital was used by the military. … Altogether 12,522 wounded and sick servicemen were cared for at Southwark Military Hospital of whom [only] 119 died; a very small percentage of those admitted and a tribute to the skill of the doctors, surgeons and nurses. See http://www.dulwichsociety.com/2010-summer/532-southwark-military-hospital. Whilst Eustace had later been in the Labour Corps, this Corps always suffered from its treatment as something of a second class organization, and the men who died are typically commemorated under their original Regiment, with the Labour Corps being secondary. Rugby Advertiser, Saturday, 23 November 1918. From a report of the unveiling, Rugby Advertiser, 11 March 1921; see also https://www.rugbyfhg.co.uk/rugby-loco-steam-shed-memorial. This entry was posted in Biography and tagged 1918, Clements, L&NW Railway, Royal Field Artillery by Christine. Bookmark the permalink.